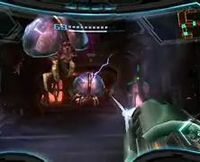 Phazon Metroids are corrupted Metroids from Metroid Prime 3: Corruption. They are the adult forms of Miniroids. Phazon Metroids are the result of Space Pirate experimentation between average Metroids and Phazon. Unlike normal Metroids, they are able to release electrical bursts at enemies. They also have the unique ability to phase through normal matter, allowing them to travel through walls and avoid attacks. They will use this ability to avoid Charge Beam shots and Ice Missiles when they are not concentrating on something else. They still maintain a weakness to extreme cold, but due to the absense of the Ice Beam, only Ice Missiles can be used. This makes them quite potent in groups or in small numbers. However, they have a weakness to the Hyper Ball, which allows Samus to kill many Metroids at once while in Hypermode. The core of the Phazon Metroids are vulnerable to the Nova Beam, allowing them to be killed in one shot. Samus first enconters them in Eastern SkyTown, Elysia, where the pirates keep them in tanks similer to those from previous games. They are later seen again on the Pirate Homeworld, in large holding cells with a number of eggs. They are also seen on Phaaze. It would seem that Phazon mutation has allowed them to produce eggs without a Queen Metroid. They should not be confused with Fission Metroids, which came about also through Phazon experimentation. Like all Metroids, great cold can immobilize the Phazon Metroid and leave it vulnerable to attacks. If the creature begins to feed, a concussive blast should be able to knock it away. Heavy exposure to Phazon energy has mutated this strain of Tallon Metroid. Subject can shift its body into a phased state, allowing it to ignore solid matter. The creature can emit bursts of Phazon energy, and will drain the life energy of its prey. This page was last edited on 25 March 2012, at 00:11.